Key Landscape can install water features that range from pond less features to fountains, bubblers to small to large ponds. These water features are custom designed to suit your design preferences and the overall theme of your landscape. We will make sure that they are installed in the perfect spots to achieve harmony in the landscape. Moreover, the proper placement of each water feature will effectively enhance the aesthetics of your outdoor area. If you want to have a relaxing outdoor ambiance or a place where you can enjoy the calming and therapeutic effects of water, please contact us at Key Landscape and Irrigation. 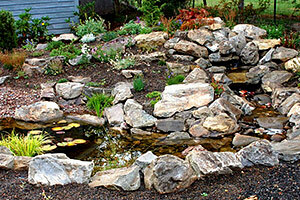 Our team is always ready to work on any kind of waterscaping project, whether in residential or commercial properties. At Key Landscape and Irrigation, we consider important factors when designing and installing water features for our New Hampshire clients. We ask our clients about their needs, design preferences, preferred water elements, and budget allocation for the project. We also consider the current landscape setup since it can limit the number and type of water elements that can be installed. We may install a small fountain or some bubbling pots if you have a small outdoor area. Meanwhile, a large landscape can accommodate several types of water amenities, such as ponds, waterfalls, large-tiered fountains, and even artificial streams. If you need help in determining the right feature to install in your landscape or property, please contact us. We will help you choose the best water features to install and the perfect locations for these amenities. We have successfully completed numerous water feature installation projects before, so we are confident that we can also satisfy your needs and project requirements. You can also take a look at our portfolio to see how we design these landscape features. We also have positive client testimonials from Keene, Hillsborough, Springfield, Franklin, Farmington, and Brattleboro areas. 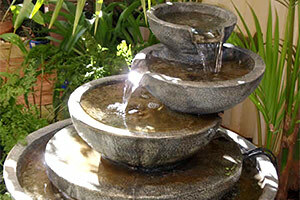 It is not enough that your contractor can create beautiful water feature designs. You should also look at the company's installation skills and capabilities. Installing complex designs requires expertise that only experienced contractors like us can offer. At Key Landscape and Irrigation, you will get professional water feature installation service without the high price tag. We also install your requested water features in a timely manner. You don't have to worry about stalled installation projects since we have all the tools and equipment to build these features. We may use excavators, graders, and other heavy-duty equipment to complete your project. These are all operated by well-trained crews to avoid damaging your garden and other outdoor structures. For more details on our waterscaping service, please contact us now at (603) 352-6496 or visit our office at Keene, NH.